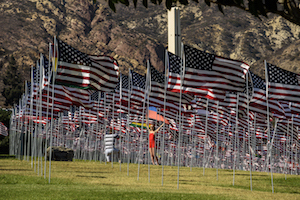 From September 9 through September 25, Pepperdine’s Alumni Park will have on display the 10th annual Waves of Flags installation to commemorate the lives lost in the terror attacks of September 11, 2001. Each year Waves of Flags features 2,977 full-size flags—2,887 American flags for each American life lost and 90 international flags representing the home countries of individuals from abroad who died in the 9/11 attacks. The installation became a Pepperdine tradition in 2008 when the school’s College Republicans group organized to bring the tribute to the campus. Pepperdine students, faculty, and staff are invited to participate in the installation of the flags on Saturday, September 9, between 12:30 and 1 PM. Registration is not required and all community members are welcome to participate.